The science of thirst: Antony Higginson, associate lecturer at the School of Chemical and Metallurgical Engineering, heads up Wits’s micro brewery. 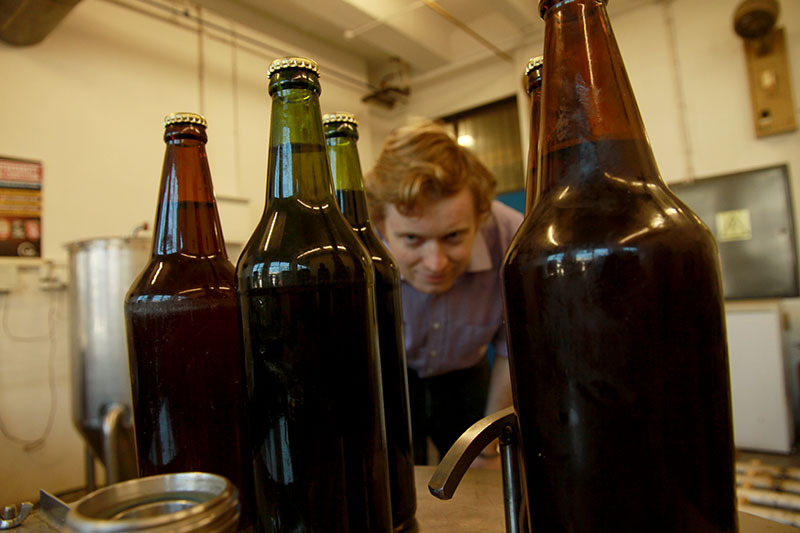 The team recently brought a 9 000-year old beer recipe to life. WITS is not only known for brewing unrest. Students have been practising a different kind of brewing in the run-up to the SAB intervarsity brewing contest, producing lager, ale and cider – as well as a beer from a 9 000-year-old Chinese recipe. Brewed from an ancient Chinese recipe, the beer was available for a small taste test during last week’s National Science Week. Ingredients include rice, honey, berries and a small amount of malt. The beer is light, slightly fruity and not quite as bitter as normal beer. This is because there are no hops in it. The recipe was provided by Brenda Cohen from the Evolutionary Studies Institute. The students teamed up with Anthony Higginson from the School of Chemical and Metallurgical Engineering to produce the competing beers. Wits will enter all three categories of the competition, but the Chinese beer will not be entered, since it does not qualify as a lager, ale or cider. The students involved in the beer brewing are postgraduates and undergraduates from process engineering and biochemistry, with an interest in beer and research. There has been an explosion of craft breweries and home brewing as a hobby, according to Higginson. Craft beer can now be enjoyed at Arts on Main and at inner city markets. This year the SAB intervarsity beer brewing challenge will take place from August 30 to the 31 at the SAB Training Institute in Kyalami. Part of the competition involves producing label ideas and names. In previous years, students have used the name Kudu Beer, and the label has included the famous Wits kudu.